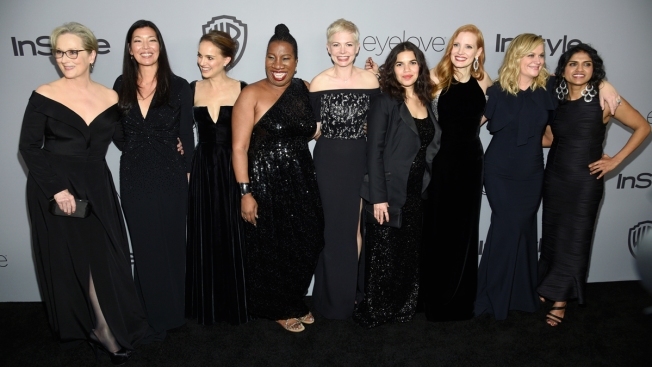 In this Sunday, Jan. 7, 2018, file photo, Meryl Streep, from left, Ai-jen Poo, Natalie Portman, Tarana Burke, Michelle Williams, America Ferrera, Jessica Chastain, Amy Poehler, and Saru Jayaraman arrive at the InStyle and Warner Bros. Golden Globes afterparty at the Beverly Hilton Hotel in Beverly Hills, Calif.
To misquote "A Star Is Born," awards shows were far from shallow in 2018. Many confronted sexual misconduct in the entertainment industry head on, but as a new year kicks off with the Golden Globe Awards on Sunday one question lingers: Will it continue for another year? For an event that's more known for its boozy moments than promoting social causes, the Golden Globe Awards went all in as the first major show of the #MeToo era last year. It embraced the newly formed Time's Up Legal Defense Fund , the red carpet was overtaken by a symbolic sea of black dresses, major stars walked proudly alongside activist leaders, Oprah Winfrey gave a barn-burner of a speech about empowerment and Natalie Portman even got in a jab about the all-male directing nominees while presenting the best director award. Every televised and non-televised event to come had to take the stage in the shadow of the Globes, and all did so in their own way, sometimes with jokes and sometimes with statements: The Screen Actors Guild had all-female presenters, guests wore white roses at the Grammys and the Oscars gave a spotlight to Time's Up leaders and Harvey Weinstein accusers Ashley Judd, Salma Hayek, and Annabella Sciorra. But this year will be different. With just days to show time, there are no major statements or demonstrations planned for the Golden Globes show or the red carpet, and it could very well set the tone for what's to come with the other awards shows. Many stars dressed in black to make a statement against allegations of sexual misconduct in the entertainment industry. "This year, there's no sense of urgency the way there was last year," said Steve Pond, awards editor for The Wrap. "By the same token, there is a sense of 'we can't go back.'" Subjects like equality and inclusiveness are now permanent fixtures of awards show discourse, Pond said, and their absence from topics discussed on stage would be "conspicuous." "But the business of everybody wearing black, I think that was kind of a one-time thing until something else that cataclysmic happens and needs to be addressed," Pond said. Hosts Andy Samberg and Sandra Oh have said that they don't necessarily intend to get political on Sunday night, but will leave the door open for anyone who wants to use their platform to do so. In an interview with The Hollywood Reporter, Samberg said he thinks "people could use a little smile." "Not to ignore anything, but we spend so much time every day wallowing in a lot of things that are happening in our world that are really depressing, and with good reason — that stuff needs to be paid attention to — but there's also power to being positive and celebratory in the tougher times as well," Samberg said. Oh added: "I don't think it's shallow to 1) have fun and 2) be honestly celebratory.... What I'm interested in is pointing to actual real change." 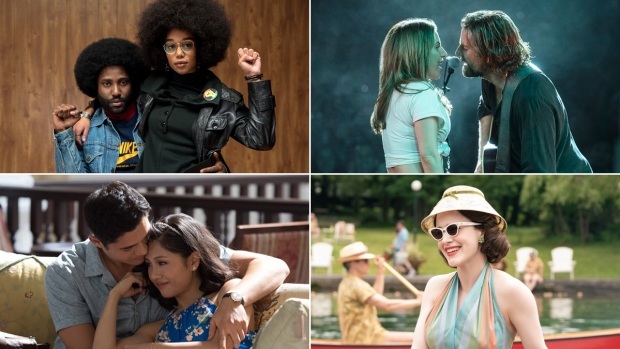 The "change" Oh referenced includes the cultural phenomena of films like "Black Panther," nominated for three awards (best drama, best original score and best original song) and "Crazy Rich Asians," nominated for best musical or comedy and best actress (Constance Wu). In other words, this year it'll be up to the individual to make a statement. 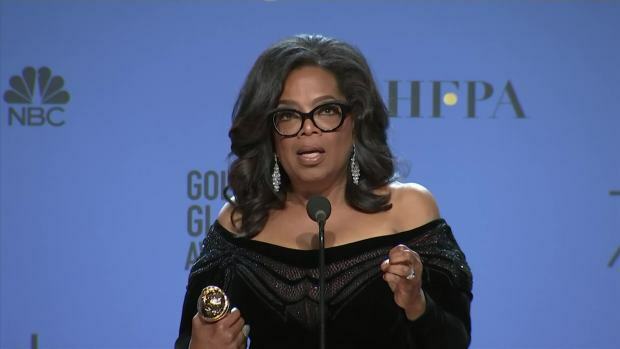 Wendy Shanker, an awards show writer who has also written speeches for individual Oscar winners, marveled at the way the actresses in Time's Up took control of the "awards season narrative" at the Globes last year. "I don't know that they necessarily need to do the same thing this year. But I do believe that you will see many of the women and men on stage referencing #MeToo, referencing the shift in our culture," Shanker said. "I think they will book people who have strong vocal public personas," said Shanker. "Producers know that's what keeps a show interesting and I think audiences are engaged by the players of social media who have something to say beyond the performances." "I think people will still have a lot of fun .... people will be looking for fun and glamour," Shanker said. "(But) the Globes were always 'the party' and now this is 'the party with a message.' It's a protest party." "In a way the Globes are kind of uniquely suited to doing that because nobody really cares who wins," Pond said. "You can put the focus on something else and it's fine." Also, for groups like Women in Film, a nonprofit organization that advocates for and advances the careers of women in entertainment, having someone like Winfrey speak about #MeToo and Time's Up on a national platform is undeniably important and has a ripple effect on the culture. "We wouldn't have seen the changes we have this year, for example Les Moonves getting fired, if it weren't for the consistent media attention on the issue," said Kirsten Schaffer, Executive Director of Women In Film, LA. "Next up (is) bringing this same attention to gender parity, because when more women are in power there is less sexual harassment and abuse."